We'll tell you the truth – we were really looking forward to seeing the D-Link Boxee Box. A previous demo we'd seen was definitely favourable, while in terms of style and power we were looking forward to something that could better the recently-revamped Apple TV. Indeed, we were looking forward to something that could kick the Apple TV completely into touch – after all, D-Link's Boxee Box is hardly short on power, being boosted by the on-board Intel Atom CE4100, having gone away from the Nvidia Tegra 2-based box previewed almost a year ago. The Atom hardware is strikingly similar to the CE4150 that has been launched in Google TV devices to date, though that's where the similarity ends it seems. There's also 1GB of flash storage inside, as well as 1GB of RAM. The other side of this box is the Boxee software – available on the PC for some time – has also been noted as a speedy and flexible interface, if not one that's exactly bug-free. 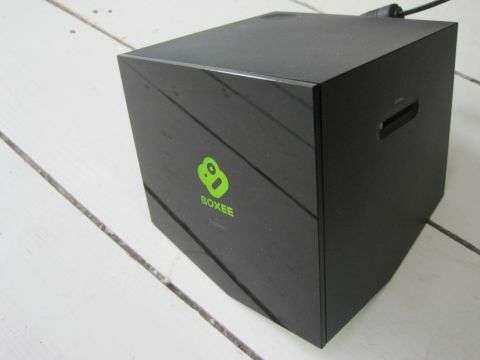 Sadly, at the end of our previous demo, the first warning sign appeared – the Boxee Box was to cost £199. This isn't exactly a surprise. After all, aside from the lack of storage, you basically have a netbook inside this lopped-off cube. However, the Apple TV is now at £99 and, while that's definitely worth the money over and above cheaper competitors, could the Boxee Box really soar so high that it justifies such a high price point? Firstly, it's worth noting that pretty much all of the Boxee Box's problems are software related. And it's bugs, rather than a fundamental problem with the interface. Indeed, like the Apple TV, navigating around the interface is slick and fast. The hardware, for D-Link's part, is super and the design of the box itself is definitely different, with a sliced-off corner and glossy finish. We're fans, even if the style divided the office. It's definitely not that great if you have a narrow-shelved cabinet under your TV. The remote, for example, is superbly finished and the keyboard on the reverse, while certainly not a cure for all controller ills, is a competent way to enter short bursts of text such as search terms or passwords. Some have commented on how the remote lacks a trackpad, but we didn't find it a problem. Connectivity is excellent – Ethernet (Wi-Fi is also included), HDMI, optical and composite audio plus two USB sockets and the power. There's also an SD card slot on the side, which you can load media from. Performance over Wi-Fi also didn't pose problems – in the main part we streamed from a Netgear ReadyNAS over a Linksys WAG160N. The box contains plenty of (standard quality) cables including HDMI, though there are few instructions to help you other than a quick start guide.